The first photo with gifts of winter gloves for homeless veterans includes Nathan Four, Director of Residential Services at the Veterans Multi-Service Center; Robert Rogers, Case Manager at the Veterans Multi-Service Center; Rick Loughery, Chester County Recorder of Deeds. 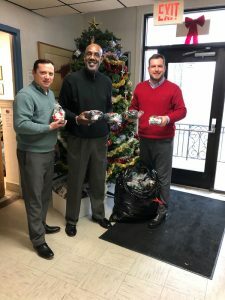 COATESVILLE — More than 125 veterans residing at the LZ II and Mary E. Walker House on the grounds of the Coatesville Veterans Affairs Medical Center were gifted brand new winter gloves as part of Chester County Recorder of Deeds Rick Loughery and his staff’s Christmas Veterans Drive. This year’s drive began when the Recorder’s office reached out to the Veterans Multi-Service Center in Coatesville asking what their veteran residents might need as they transition from homelessness to independence. The answer was simple: winter gloves! The LZ II and the Mary E. Walker House, part of the Veterans Multi-Service Center non-profit agency, provide transitional housing for homeless veterans with the goal to help them achieve independence. Loughery and the Veterans Multi-Service Center facilities in Coatesville have partnered for the past six years as part of the Recorder of Deeds Veterans ID & Discount program, which honors Chester County Veterans with special ID cards recognizing their service and offering discounts to businesses across the county. The Recorder of Deeds office visits the Coatesville VA campus at least twice a year with the program. LZ II, an abbreviation of “Landing Zone II,” is a ninety-five bed transitional residence for homeless male Veterans. Known as “home” to over a thousand Veterans who have lived there since its opening in June of 1997, LZ II offers a safe, secure, and supportive environment in a structured program that fosters respect, recovery and responsibility while increasing independence as the Veteran transitions back into the community. The Mary E. Walker House is a thirty bed transitional residence for homeless female veterans. Many of these women suffer from military sexual trauma; at present approximately 60% of the residents have this diagnosis. Currently one of the largest women veteran transitional residence in the country, the Walker House and its staff strive to provide a comfortable, safe, and secure life-setting, while fostering respect, responsibility, and recovery.